This stuffing recipe is perfect for entertaining. 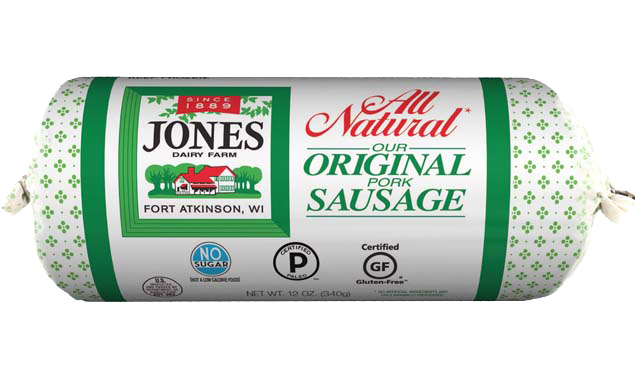 The richness of Jones breakfast sausage is enhanced by fresh pears and dried cranberries. This recipe is made with a Jones All Natural Roll Sausage. Cut bread into 1-inch cubes and place on baking sheet. Bake about 15 minutes at 400˚F. Bread should be crispy and dry. In large skillet, brown sausage until cooked through, breaking it up as it cooks. Drain excess grease and set sausage aside. Wipe out pan and add butter over medium heat. Add onion and celery, sauté 8-10 minutes or until soft. Add sausage back to pan, reduce heat to low to keep warm. 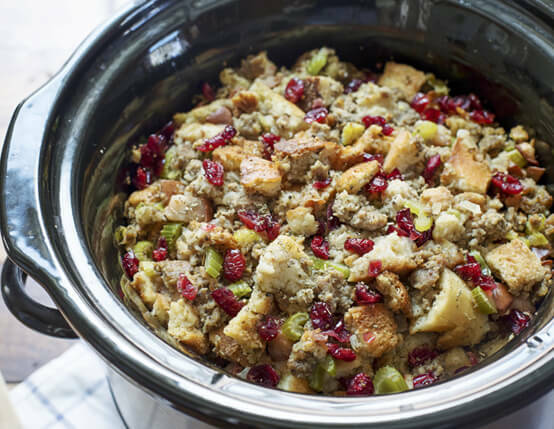 In large bowl, toss bread cubes with sage, poultry seasoning, salt, pepper, diced pears and cranberries. Add sausage mixture and stir to combine. Whisk eggs and chicken broth together and pour over bread mixture. Stir to combine. Transfer mixture to greased slow cooker. Cover and cook on low 3-4 hours, until mixture is moist and spongey. I made this with a bag of Brownberry stuffing to save time. Brownberry is already seasoned so I did not add spices. Make sure your pears are ripe. I used a large size slow cooker. Great recipe. It makes a lot so I froze some for a later date. Another great stuffing recipe from Jones! This was a huge hit and the fact that it didn't take up oven space and could be prepped hours before the meal was a big bonus.